You are relaxing comfortably, eyes closed, with non-invasive sensors attached to your scalp that are picking up signals from various areas of your brain. The signals are converted by a computer to audio tones that you can hear on earbuds. Over several sessions, the different frequencies (pitches) of the tones associated with the two hemispheres of the brain create a mirror for your brainwave activity, helping your brain reset itself to reduce traumatic stress. In a study conducted at Wake Forest School of Medicine, 20 sessions of noninvasive brainwave “mirroring” neurotechnology called HIRREM* (high-resolution, relational, resonance-based electroencephalic mirroring) significantly reduced symptoms of post-traumatic stress resulting from service as a military member or vet. “We observed reductions in post-traumatic symptoms**, including insomnia, depressive mood, and anxiety, that were durable through six months after the use of HIRREM, but additional research is needed to confirm these initial findings,” said the study’s principal investigator, Charles H. Tegeler, M.D., professor of neurology at Wake Forest School of Medicine, a part of Wake Forest Baptist. About 500 patients have participated in HIRREM clinical trials at Wake Forest School of Medicine and other locations, according to Brain State Technologies Founder and CEO Lee Gerdes. Brain State Technologies | HIRREM process, showing a technologist applying Brain State Technologies’ proprietary HIRREM process with a military veteran client. HIRREM is intended for medical research. A consumer version of the core underlying brainwave mirroring process is available as “Brainwave Optimization” from Brain State Technologies in Scottsdale, Arizona. The company also offers a wearable device for ongoing brain support, BRAINtellect B2v2. HIRREM is a neurotechnology that dynamically measures brain electrical activity. It uses two or more EEG (electroencephalogram, or brain-wave detection) scalp sensors to pick up signals from both sides of the brain. Computer software algorithms then convert dominant brain frequencies in real time into audible tones with varying pitch and timing, which can be heard on earbuds. In effect, the brain is listening to itself. It the process, it makes self-adjustments towards improved balance (between brain temporal lobe activity in the two hemispheres — sympathetic (right) and parasympathetic (left) — of the brain), resulting in reduced hyper-arousal. No conscious cognitive activity is required. Signals from other areas of the brain can also be studied. “Thus, if the stimulus is acoustic response to brain function (often called neurofeedback (NFB), then the response is made based on a threshold of the NFB provider. Since the brain moves three to five times faster than the thoughtful response of the client, the brain’s activity is way beyond any kind of activity which the client can mitigate. The NFB hypothesis is that the operant conditioning can be learned by the brain so it changes itself. The study was published (open access) in the Dec. 22 online edition of the journal Military Medical Research with co-authors at Brain State Technologies. It was supported through the Joint Capability Technology Demonstration Program within the Office of the Under Secretary of Defense and by a grant from The Susanne Marcus Collins Foundation, Inc. to the Department of Neurology at Wake Forest Baptist. The researchers acknowledge limitations of the study, including the small number of participants and the absence of a control group. It was also an open-label project, meaning that both researchers and participants knew what treatment was being administered. * HIRREM is a registered trademark of Brain State Technologies based in Scottsdale, Arizona, and has been licensed to Wake Forest University for collaborative research since 2011. In this single-site study, 18 service members or recent veterans, who experienced symptoms over one to 25 years, received an average of 19½ HIRREM sessions over 12 days. Symptom data were collected before and after the study sessions, and follow-up online interviews were conducted at one-, three- and six-month intervals. In addition, heart rate and blood pressure readings were recorded after the first and second visits to analyze downstream autonomic balance with heart rate variability and baroreflex sensitivity. HIRREM has been used experimentally with more than 500 patients at Wake Forest School of Medicine. ** According to the U.S. Department of Veterans Affairs, approximately 31 percent of Vietnam veterans, 10 percent of Gulf War (Desert Storm) veterans and 11 percent of veterans of the war in Afghanistan experience PTSD. Symptoms can include insomnia, poor concentration, sadness, re-experiencing traumatic events, irritability or hyper-alertness, and diminished autonomic cardiovascular regulation. *** The effect is based on the “bihemispheric autonomic model” (BHAM ), “which proposes that trauma-related sympathetic hyperarousal may be an expression of maladaptive right temporal lobe activity, whereas the avoidant and dissociative features of the traumatic stress response may be indicators of a parasympathetic “freeze” response that is significantly driven by the left temporal lobe. An implication [is that brain-based] intervention may facilitate the reduction of symptom clusters associated with autonomic disturbances through the mitigation of maladaptive asymmetries.” — Catherine L. Tegeler et al./Military Medical Research. Update Jan. 10, 2017: What about a control group? “Our study had an open label design, without a control group,” Tegeler explained to KurzweilAI in an email, in response to reader questions. “We agree that a randomized design is scientifically a more powerful approach, and one we would have preferred. The reality was that for this cohort of participants, mostly drawn from the special operations community, constraints due to limitation on allowable time away from duties, training cycle pressures, therapeutic expectations, and available funding, prevented consideration of a controlled design. 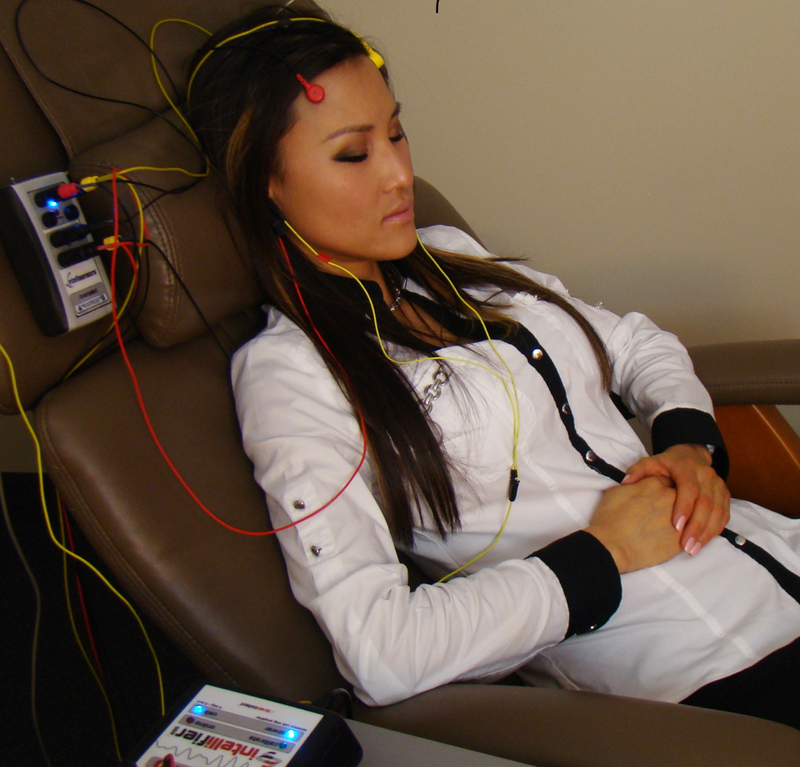 “Biofeedback/neurofeedback is an open-loop system indicating that the feedback from the brain or other biological function is provided back to the client as the function being analyzed triggers a stimulus,” Gerdes added. Background: Military-related post-traumatic stress (PTS) is associated with numerous symptom clusters and diminished autonomic cardiovascular regulation. High-resolution, relational, resonance-based, electroencephalic mirroring (HIRREM®) is a noninvasive, closed-loop, allostatic, acoustic stimulation neurotechnology that produces real-time translation of dominant brain frequencies into audible tones of variable pitch and timing to support the auto-calibration of neural oscillations. We report clinical, autonomic, and functional effects after the use of HIRREM® for symptoms of military-related PTS. Methods: Eighteen service members or recent veterans (15 active-duty, 3 veterans, most from special operations, 1 female), with a mean age of 40.9 (SD = 6.9) years and symptoms of PTS lasting from 1 to 25 years, undertook 19.5 (SD = 1.1) sessions over 12 days. Inventories for symptoms of PTS (Posttraumatic Stress Disorder Checklist – Military version, PCL-M), insomnia (Insomnia Severity Index, ISI), depression (Center for Epidemiologic Studies Depression Scale, CES-D), and anxiety (Generalized Anxiety Disorder 7-item scale, GAD-7) were collected before (Visit 1, V1), immediately after (Visit 2, V2), and at 1 month (Visit 3, V3), 3 (Visit 4, V4), and 6 (Visit 5, V5) months after intervention completion. Other measures only taken at V1 and V2 included blood pressure and heart rate recordings to analyze heart rate variability (HRV) and baroreflex sensitivity (BRS), functional performance (reaction and grip strength) testing, blood and saliva for biomarkers of stress and inflammation, and blood for epigenetic testing. Paired t-tests, Wilcoxon signed-rank tests, and a repeated-measures ANOVA were performed. Results: Clinically relevant, significant reductions in all symptom scores were observed at V2, with durability through V5. There were significant improvements in multiple measures of HRV and BRS [Standard deviation of the normal beat to normal beat interval (SDNN), root mean square of the successive differences (rMSSD), high frequency (HF), low frequency (LF), and total power, HF alpha, sequence all, and systolic, diastolic and mean arterial pressure] as well as reaction testing. Trends were seen for improved grip strength and a reduction in C-Reactive Protein (CRP), Angiotensin II to Angiotensin 1–7 ratio and Interleukin-10, with no change in DNA n-methylation. There were no dropouts or adverse events reported. Conclusions: Service members or veterans showed reductions in symptomatology of PTS, insomnia, depressive mood, and anxiety that were durable through 6 months after the use of a closed-loop allostatic neurotechnology for the auto-calibration of neural oscillations. This study is the first to report increased HRV or BRS after the use of an intervention for service members or veterans with PTS. Ongoing investigations are strongly warranted. Gerdes L, Gerdes P, Lee SW, and Tegeler CH. (2013). 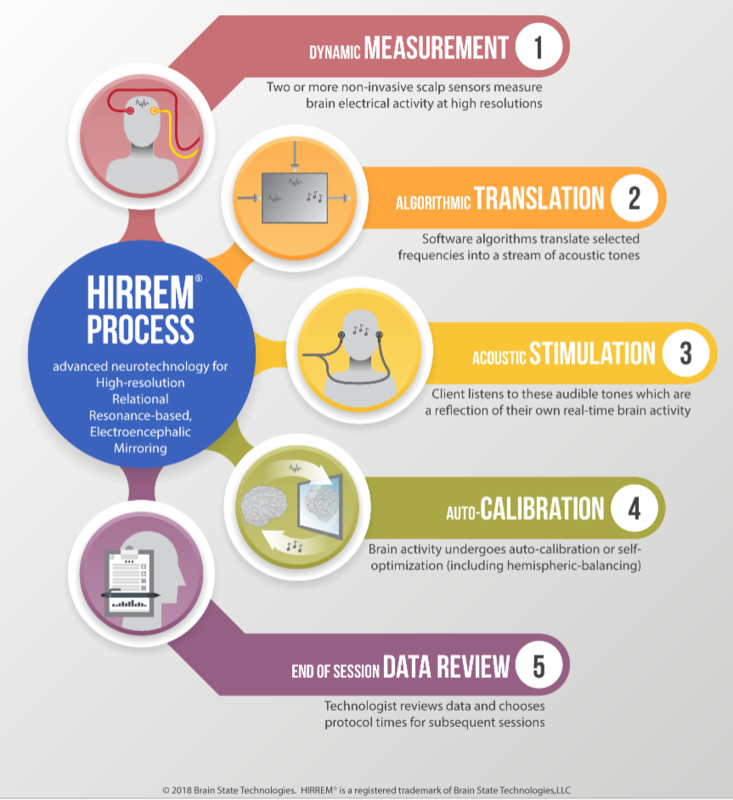 HIRREM®: a non-invasive, allostatic methodology for relaxation and auto-calibration of neural oscillations. Brain Behav. Mar; 3(2): 193-205. Tegeler CH, Cook JF, Tegeler CL, Hirsch JR, Shaltout HA, Simpson SL, Fidali B, Gerdes L, and Lee SW. (2017). Clinical, hemispheric, and autonomic changes associated with use of closed-loop, allostatic neurotechnology by a case series of individuals with self-reported symptoms of post-traumatic stress.BMC Psychiatry. Tegeler CH, Shaltout HA, Tegeler CL, Gerdes L, and Lee SW. (2015). Rightward dominance in temporal high-frequency electrical asymmetry corresponds to higher resting heart rate and lower baroreflex sensitivity in a heterogeneous population. Brain Behav. 5(6): e00343. Lee SW, Gerdes L, Tegeler CL, Shaltout HA, and Tegeler CH. (2014). A bihemispheric autonomic model for traumatic stress effects on health and behavior. Front. Psychol. 5:843.